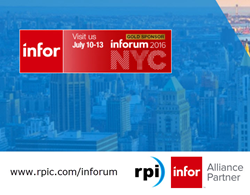 RPI Consultants, a recognized leader in providing Infor Lawson Services, is a Gold Sponsor at Inforum 2016, which is July 10-13 at the Javits Convention Center. RPI will bring more than 30 consultants with expertise across all Infor Lawson functional and technical areas to Inforum. Attendees are able to schedule meetings with RPI Subject Matter Experts including any of the topics listed below. You may schedule a meeting at: http://www.rpic.com/inforum. In addition, attendees will have the option to design their own meeting and get a tailor-made experience. Some RPI team members supporting our meetings include RPI’s HCM Practice Manager Melissa Olson, Senior Consultants Cindi Brackins, Robert Crissman, Stephanie Kowal, Jeff House, Kathy Williams, Leonard Woodall, HCM Consultant Jackie Dudas, and Partners Richard Stout, Geoff Lilienfeld and Justin Braun. Melissa Olson, RPI’s HCM Practice Manager, will deliver session HCM-002SSP: Take the Leap from S3 to GHR on Monday, 7/11/16 at 2:00 PM in Theater 3. Mrs. Olson has vast experience in the Lawson HCM/HR space, as both a consulting leader and a former Lawson HCM customer. She is a frequent presenter at Lawson User Groups, RPI’s popular webinar series, and is recognized as a thought leader. Melissa and her team will be leading one-on-one customer sessions related to HCM, HR/Payroll optimization, Global HR and other HR/Payroll areas. Supporting her will be Senior Lawson Consultant Jeff House and HCM Consultant Jackie Dudas. Richard Stout, RPI’s Technical Practice Manager, will host LAWS-006SSP “Richard Stout – NYC Open Mic” at 4:00 PM on Tuesday, 7/12/16 in Theater 2 about Infor Lawson Technology. He will also be available for meetings on Cloud Strategy and Lawson Technologies. Mr. Stout has a deep understanding of Lawson architecture and technology. He has worked extensively with Infor & Lawson Process Automation (IPA) and various reporting, workflow, and imaging solutions. At the forefront of early adoption of Infor technologies, Richard is a regular presenter and technology evangelist in the Lawson community. Cindi Brackins and Bob Crissman, Senior Lawson Financials Consultants, will be available to meet with customers one-on-one. Together they have over 35 years’ consulting experience with Infor Lawson and bring a wide range of expertise across Lawson’s Financial Suite including Grants, Project Accounting and Billing and Revenue Recognition expertise as well as Lawson General Ledger, Activity Management, Billing and Revenue Management, Grants Management, Accounts Payable, Asset Management, Cash Ledger, LBI, Design Studio and Payroll. Both have industry experience and frequently present to the Lawson User Group community and in RPI’s unique webinars. Lawson Procurement Consultant Stephanie Kowal will also be available to meet one-on-one with customers to review Contract Management functionality and deployment strategy. Mrs. Kowal has extensive experience working in materials management, process improvement, project management and system administration. She has lead implementations and process improvement efforts surrounding electronic requisitions and approval processes and created user training materials and sessions for more than 1,000 requesters and approvers. She has been a frequent presenter on Lawson Procurement topics since joining the RPI team in both the Lawson User Group community and RPI’s webinars. The RPI booth #135 is located in the Infor Hub at the Javits Center in NYC. At the booth, attendees will have the opportunity to meet with our Infor Lawson project, functional, and technical experts, schedule a free meeting, or just stop by to visit. RPI will offer the free meetings throughout Inforum, so to schedule, visit http://www.rpic.com/inforum. Additionally, if you are not attending Inforum, RPI will offer virtual meetings after Inforum – to schedule a virtual meeting, contact Logan Miller at lmiller(at)rpic(dot)com. RPI Consultants is a business applications implementation and optimization firm focused on delivering best practices through technology, systems integration, and process redesign. The RPI team includes certified technical and functional experts in Infor’s Lawson products; Kronos; and Lexmark’s Perceptive Content, Perceptive Capture and Kofax as well as other automation technologies to enhance the procure-to-pay, financial reporting, and human resources processes.